“Maritime forests, mesic Coastal Plain bluffs and flats,bottomlands, now also widely naturalized, spreading from cultivation into wet to mesic forests. The pre-Columbian range was apparently from se. NC south to c. peninsular FL, west to e. TX, largely on the Coastal Plain, now somewhat expanded northward and inland by naturalization from centuries of horticultural planting. Curtis (1860) states that “the northern limit of this tree is in Brunswick County, south of the Cape Fear; but it flourishes in cultivation through all the lower part of the State.” (Weakley 2015). 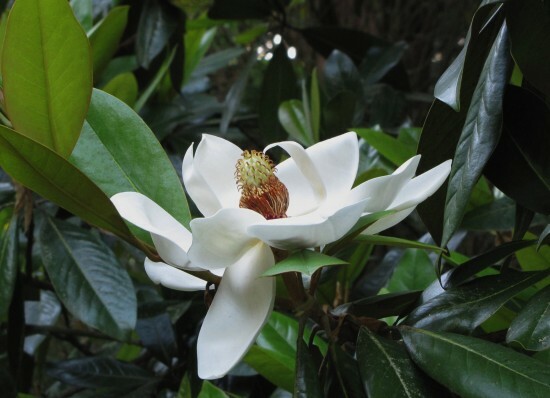 Rare native in the NC Coastal Plain, rare escape from cultivation in the NC Piedmont and Sandhills. “Bull Bay is native in the Sandhills of southern SC and GA but found in the NC Sandhills only as a result of bird-dispersed seeds from cultivated trees” (Sorrie 2011). NC Natural Heritage Program NC Rank: S2? 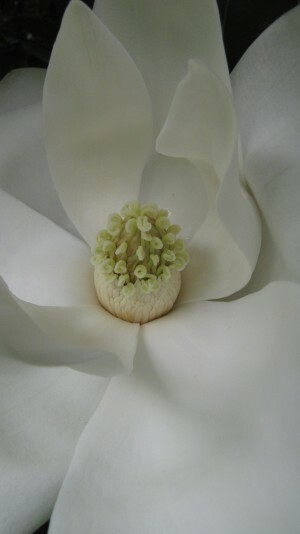 Magnolias are an ancient genus with a "primitive" arrangement of flower parts. The white tepals are lowermost, held open in a bowl-shape. 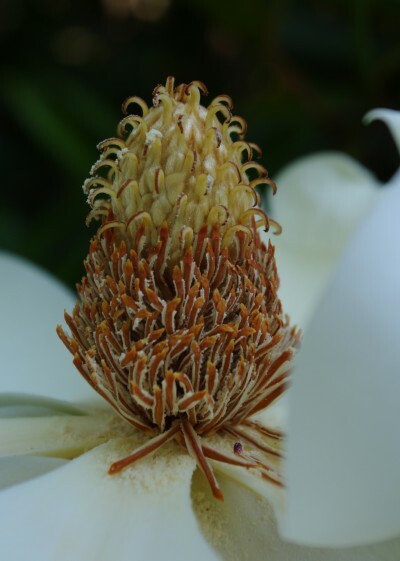 Above them on a cone-like structure are whorls of stamen with the carpels at the top. This structure has been thought to be beetle-pollinated. 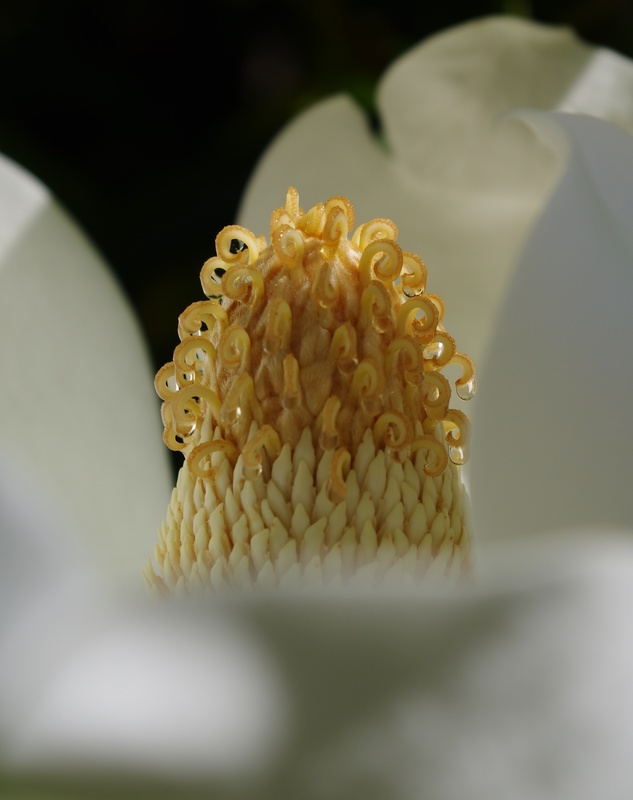 Despite the accepted thinking that beetles are the main pollinators of Southern Magnolia, research by Larry Allain suggests that Southern Magnolias and bees, especially honeybees and some Sweat Bees, interact to pollinate the trees. When a flower first open, UV patterns, fragrance and nectar attract bees to the reflexed stigma. Same flower, next day, showing pollen. 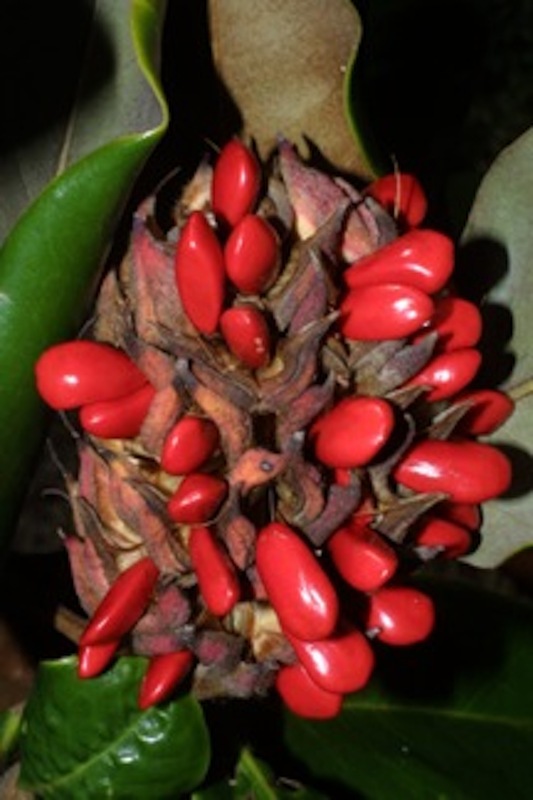 On the second day, the production of nectar stops and the anthers produce large amounts of pollen that fall into the petals, attracting bees and beetles. The flowers will stay open for 1 or 2 more days, gradually losing fragrance, UV reflectivity and pollen viability. Note the pollen that now adheres to the stigma above, likely the result of cross-pollination the day before.